In March 2010, at the Spring Equinox, I set off from my home in Totnes to walk all around England, in a pair of old red flip flops, visiting Transition towns, listening to people’s stories, and sharing them with others. I stayed with a remarkable number of remarkable people, all heroes in the Tales of Our Times. I came home 6 months later, in the September, in time for the Autumn Equinox, and there began the long process of turning that journey into a folktale. This June, just in time for Midsummer, I finished writing, and yesterday, I received the very first felt cover, leather spined books. They are beautiful; the handiwork of Dartmoor book binder and printer Joanna Radford of Hannaford Press, and felt artist Geraldine Finnon of the Cauldron Studio, Bowden House, Totnes. 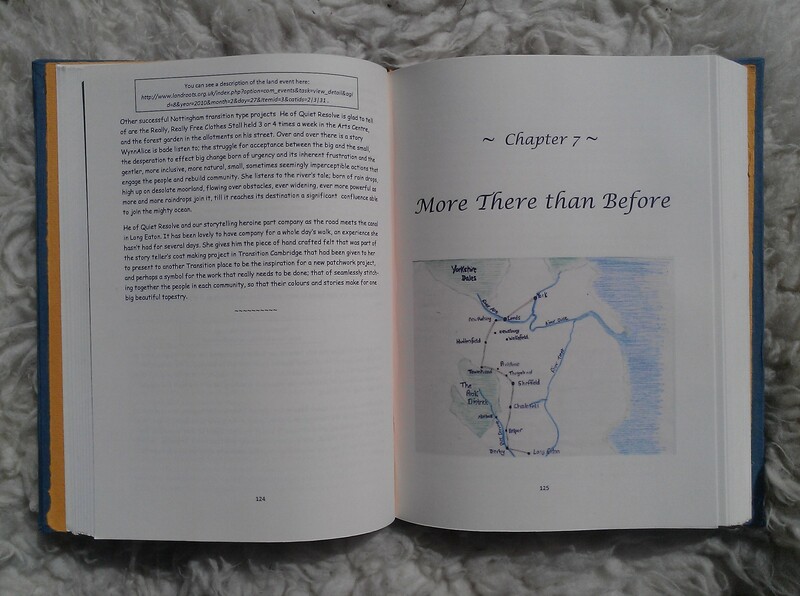 The book, printed on recycled paper, with local wool used in the feltwork, boasts prints of two unique paintings by soulscape artist Herewood Gabriel, and hand drawn maps of the pilgrimage. There are to be 13 of these exquisite works of local art in total, a first edition, of which 12 have already been allocated or claimed. The 13th copy is to be raffled. Tickets cost £5.00. The winning ticket will be drawn on Saturday the 19th October, the full moon closest to the cross quarter celebration of the beginning of Winter; Sawain, at the Launch Party, to be held at Rattery Village Hall (TQ10 9LD) from 7-9pm. You can buy your ticket here. To come along to the Launch Party, where I will be performing some tales from the book, accompanied by gifted local musician Christoffer de Graal, who hosted me as my journey homewards took me past his home in Tedburn St Mary, please RSVP as soon as possible; tickets cost £10 (including tea, homemade cake, and your raffle ticket) and are limited to hall capacity. You can buy your Launch Party ticket here. If the holder of the winning ticket is not at the Launch to be formerly presented with their book, worth £100.00, you can arrange for it to be collected in Rattery from the 20th October. 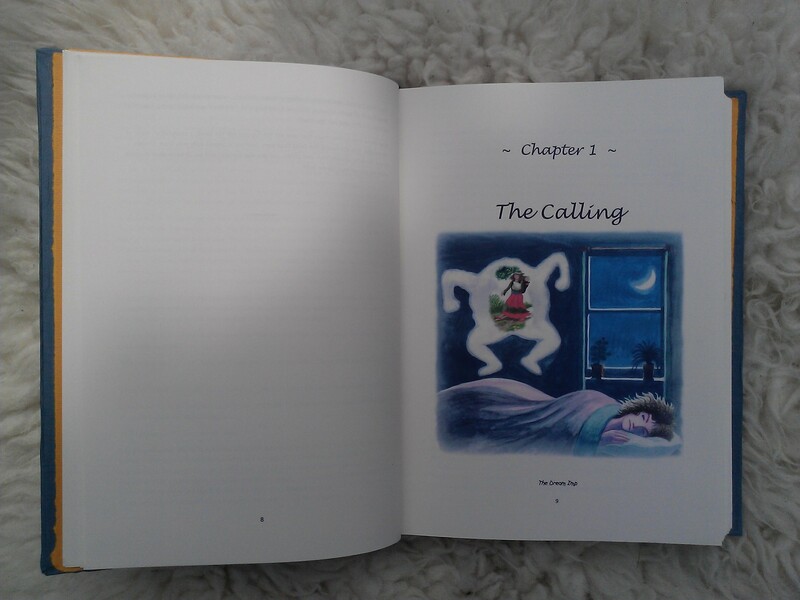 Please note that the book, complete with its cloth bound slip cover, is an A4 size hardback and weighs just over 2kg. There will be a charge of £30 for packing and Special Delivery if you choose to have the book posted to you. Should you not be fortunate enough to win the prized 13th book, some signed copies of the limited edition cloth bound edition will be on sale at the Launch. Only 150 copies of this edition will be made, so if you can’t make it to the Launch and would like a copy please email me to reserve a copy as soon as possible. 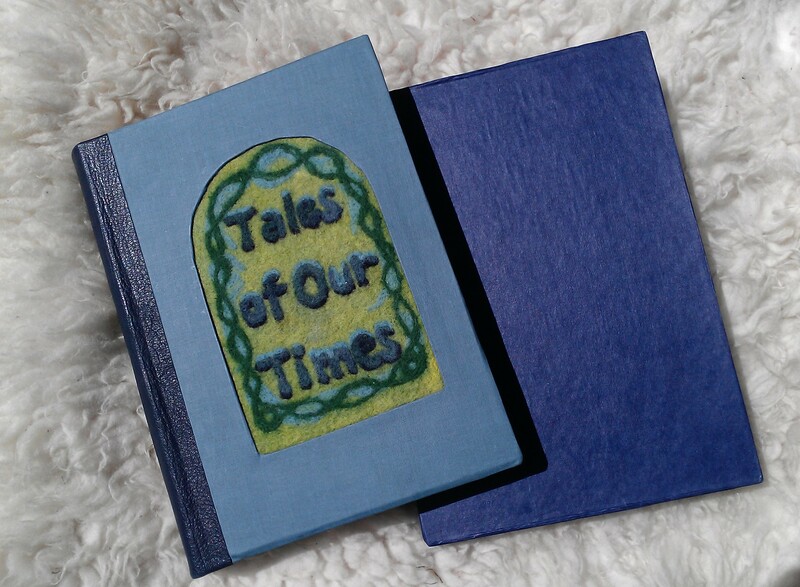 Also at the Launch there will be the opportunity to buy a share in Tales of Our Times, the company I have set up in order to administrate the ongoing publication project of printing an accessible-to -everyone paperback version of the book. If you are from one of the towns, cities or villages who hosted me on that pilgrimage and would like to buy a copy of the limited edition cloth bound book for your initiative, please contact me to arrange a local storytelling performance where I will present your book to you. It hasn’t been easy for a woman of little means, perhaps I go as far as to say now, no means, to bring a project such as this to this point, and I want to give special thanks here to Transitioners Ben Brangwyn, Marion McCartney, and Nicola Hillary, as well as to Fanny Behrens and Michael Holt, without whose support and faith in me this book would not have existed. This whole project has been a leap of faith for me; from a dream in the night, to the risk of walking far from home without financial security, relying on the good nature of others, and finding my fellow human beings infinitely generous and open to be inspired, to finally to spending every last penny I had to take the time off to write the book, daring to ask for support for the next step, and receiving it. I now take courage once more, and ask, could you help me to realize my dream to its fullest extent; by paying for your copy of the book, whether it be the cloth bound limited edition version, or the paperback tales, in advance, so that the printing costs can be covered. Click the link to buy a raffle ticket, a Launch Party ticket, order a book, buy a share, or otherwise donate to this project. My dream; to see the folktales of Our times reach out far and wide to as diverse a group of people as possible, to spread the tales of what we can do, when we are inspired to reach out for the future we want. With each edition of the tales I plan to make the story more folk tale like and more accessible to those who may never have heard of Transition, but who still may be inspired by the stories of what has already been achieved. I want to thank you all, each and everyone of you who have made this adventure of mine as rich as it has been. I hope you will find my words have done you justice. PS You can listen to me narrating the Tales of Our Times by clicking on the MixCloud links to the right to my local radio shows from Soundart Radio. Travel Information for Well Being and Eco Tourism Course. Vision the Future …. and help Create it!